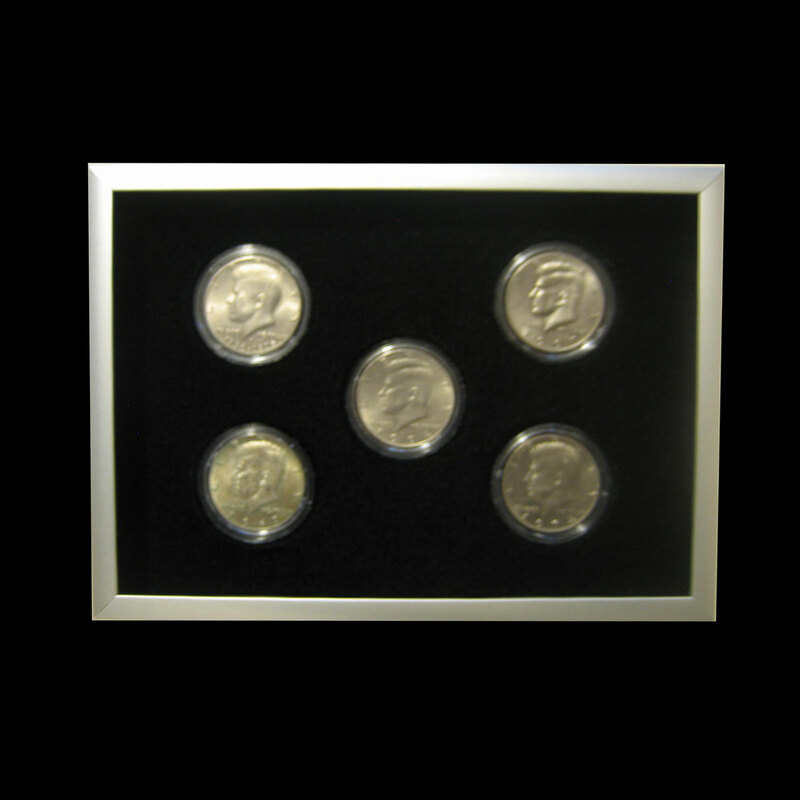 These Aluminum 5" x 7" Coin/Bullion Display Frames for Five U.S half dollars and other various 30.5mm medallions are made with the finest framing materials in the industry. Designed and constructed with superior quality for a life time of elegant beauty to protect and preserve your precious rare coins and collectable bullion pieces. The Acrylic Airtight Capsules are mounted in a backboard made of a plush black velvet material and the backboard is mounted a 1/2 inch below the glass to create a shadow box effect. these aluminum coin/bullion display frames can easily be mounted to a wall or look great just as a desk top or end table display. 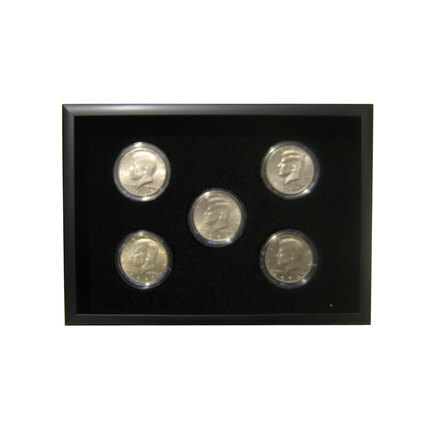 All Aluminum coin/bullion display frames come complete with mounting hardware, Acrylic Airtight Capsules, Glass and a two piece protective container. Frame Dimensions 5" x 7" x 1.25" some assembly required. 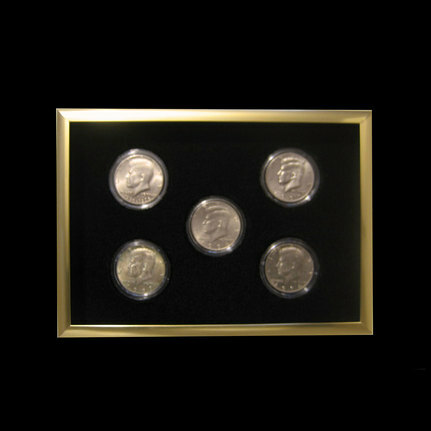 ALL IN STOCK FRAMES ARE ONLY AVAILABLE IN BLACK BACKGROUND MATERIAL OTHER COLOR BACKGROUND MATERIAL CAN BE CUSTOM ORDERED SEE OUR CUSTOM ALUMINUM COIN/BULLION DISPLAY FRAME PAGE FOR MORE DETAILS. 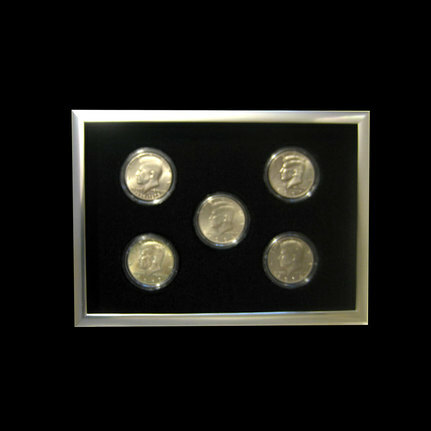 Don't waste your time looking for these Aluminum Coin/Bullion Display Frames anywhere else, these Aluminum Coin/Bullion Display Frames can only be found and purchased here through Rising Star Mint Inc.
Don't see the Aluminum Coin/Bullion Display Frame your looking for ? Just go to our Custom Aluminum Coin/Bullion Frames page for more details on how to have just the right size, color and layout your looking for made to fit just the coins/bullion pieces your looking for. 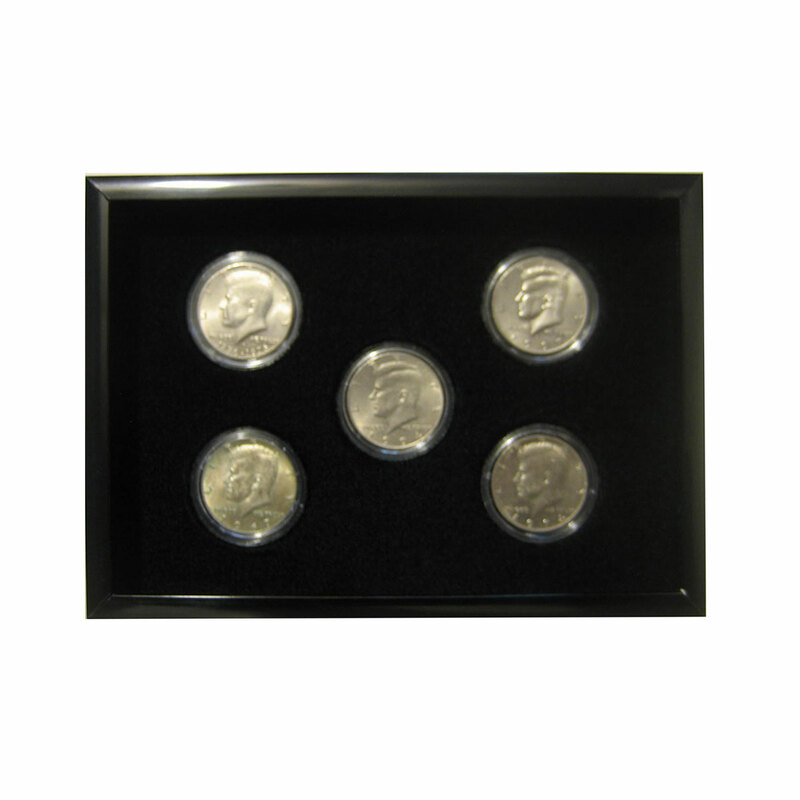 All in stock aluminum coin/bullion display frames ship the next business day after payment has cleared. Custom made aluminum coin/bullion frames ship in 7 business days or less after payment has cleared. We ship Anywhere U.S.P.S International priority mail is accepted. PLEASE NOTE: Be sure to check your Bullion size we will not accept returns on airtight cases and protective cases, display frames that wont fit. All sizes are listed in our listings Thank you. Were not happy unless you are. all prices are subject to change without notice due to the constant change in the market. returns are accepted if products remain uncirculated and untouched by human hands,Money Back refund less shipping cost. Full refunds will be given as Merchandise credit were not happy unless you are. Money Order Domestic (U.S) Money order or Cashiers Check payments Free of Shipping Charges. International Money Orders or Cashiers Checks payments $15.99 U.S.D funds Flat Rate Shipping Charge. See Shipping Details Page for Details.